Spoke to a bloke on Saturday morning, rang a recovery driver and by 9pm I had a syncro sat in my workshop. It's been off the road for a few years, it's had some work done but previous owner was lacking time and bailed out. He didn't want to see it go to waste to be another unfinished project so reluctantly let me take it. 1987 twin sliding door panel van with a walk through bulkhead in Bronze beige metallic. 2.1l [*spit] wasserleaker with AAN box. It's a fairly high spec panel van, PAS, CDL, heated rear screen, rear washer. It did have electric mirrors and electric windows but they have gone. We had the last half hour at work today to get it on the ramp and have a poke about. It's fairly rough to be honest, small bits of welding here and there but it's sporting quite a few battle scars and it's wearing lots and lots of paint. It's not the straightest and to get it straight is going to take a lot of time and effort so at the moment I'm thinking of getting it solid and something like then good old RAL6014 OlivGelb. It's sporting these rims at the moment. But I'm not keen to be honest. Date stamped 1983 and do look like BBS but at ET22 and only 6x14 I think they will be taking a walk to the shelf of things I want to keep but should really get rid of. They also do look suspiciously like the holes have been drilled out from 12mm to 14mm to suit the T3 studs. 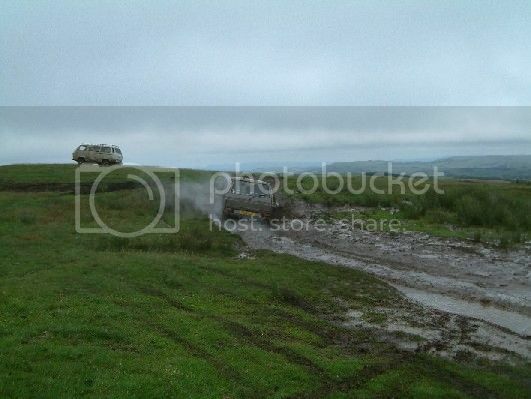 Again, early days but I reckon on a set of 16" Mefro and some 205R16's probably Hankook Dynapro's. Underneath is together and working and probably okay but it's ugly, so I'm going to strip everything off and deal with it, rebush it with fresh ball joints and then crack on. trailing arms aren't going to come off, tank straps are knackered, back brakes look like they are toast judging by the state of the back plates. Front to rear coolant pipes feel like the ends have come off. Basically it wants rebuilding! so, when your ordering from the webshop and thinking that b*stard Baxter is having more of my money, don't worry it's just the same for me! Obviously, it goes without saying that the wasserleaker will be going in the canal, I'm not going to Subaruin it either, AFN TDI seems the logical choice. I thought about a GTI engine for about 10 seconds, good though they are they lack power from low down and don't pull like a Diesel does. I have a pair of sliding doors for it with factory windows and sliding glass, and I want to put a bench from a Caravelle in the middle to make it into a 5 seater, view won't be amazing in the back! I know a few of you will be sat there thinking "What's he doing to that van, he'll ruin it" well, to be fair, that's already happened. If it was a little worse it would be bin fodder. if it was a lovely straight van maybe I would feel differently but as I see it at the moment it's being saved from the chop. there's holes all over the place both drill and rust induced, there's some proper special wiring and it's wobbly so it's going to be matt green okay!! I had a sneaky feeling it would be that one when you said twin slider and petrol. Are you going to put back all the nice bits that Matt sold? 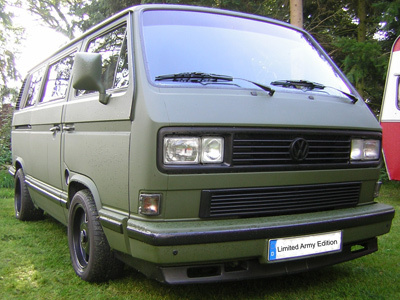 Its great to see that its going to get the attention its crying out for and if I could choose a colour for a van, that would be it. Panel van , brown interior , random knobs and switches drilled into dash , what's not too like? Splinter group beckons . jed the spread wrote: Are you going to put back all the nice bits that Matt sold? .....and if I could choose a colour for a van, that would be it. Spec wise, yep, seems daft not to put it back his it was although it needs some front doors as its had some 6x9's. Hacked into these in a properly special place and ruined the doors. Which colour? Metallic dog egg or Matt green? Matt green I reckon, and no brightwork on it at all. Like the old base spec beetles. I just want to be careful with the drivetrain though, tall tyres are all well and good but the gearbox and CV joints and breaks have to put up with the extra load. 205R16's should be enough for me. I think I would rather spend the money on a ring and pinion or a gearbox than go mental with tyres and have loads of problems with driveshafts and things breaking. PM me a price for the tyres, but remember I have a tyre machine and a few accounts with wholesalers ! Think I'll put a decoupler on as I want to have 1 spare tyre rather than 17. All in the future though, need to get these holes zipped up and some plod in it first while I start amassing bits! Owner of Flintstone, our T3/25 Caravelle C Syncro 1.9 Petrol. Its your van and saving it from its current dire state has to be better than any other fate it might had pending. Matt Green (like your old panel van?) sounds good. I'm sure having a development mule Syncro around will pay off over time. '90 Syncro Hightop. Ex-BUPA/Rowan ambulance with 2.0L GTI power and some curious windows. Those alloys would sell to a Mercedes W123 owner ..... de rigeur back in the day! Got some work to do eh! I spoke to my mate in Germany, I asked which green was correct for Bundeswehr vehicles in 1987, he said RAL6031, which is the base colour for the "Flecktarn" camo. Heres a T3 in RAL6031. The van has a reservoir for headlamp washers however there are none fitted. Luckily I have a spare set so they will be going back on too, round headlamps and headlamp washers are ace! Solid tailgate ordered today for little more than what people wanted for second hand ones. last one from Classic without the badge recess no less. It's also missing it's wheel arch spats, the ones that came on 6x14 syncros, again I have an almost new set just waiting for the right van. Rear diff lock seems lazy, but came on eventually, front just couldn't be bothered. I don't suppose they have any more solid tailgates do they? Maybe one with a badge in that would fit a late panel van? Would be perfect for a little idea i have in mind. Yes there is, currently "sat on the pot" so can't check for sure but the later ones are about five and a half hundred quid. Simon Baxter wrote: Basically it wants rebuilding! so, when your ordering from the webshop and thinking that b*stard Baxter is having more of my money, don't worry it's just the same for me! So you got my message at the weekend then! !